The efficiency of data transmission through ordinary optical fibres has been enhanced using a quantum-mechanical technique known as superdense coding. Physicists in the US have shown that they could nearly double the capacity of a fibre link compared with conventional transmission – and the researchers say their work could increase how much data the internet can handle. Superdense coding exploits the phenomenon of entanglement to double, at least in principle, the capacity of an information channel. A single binary bit sent down a channel can normally encode two possible values – 0 or 1. But a single quantum bit, or qubit, that is entangled with a second qubit some distance away can instead encode four possible values. This is because the two particles, even though spatially separated, are strongly correlated with one another and so effectively act as a single entity. The total information transmitted is therefore equivalent to that of two classical bits. First demonstrated experimentally in 1996, superdense coding involves two people – usually known as Alice and Bob – sharing a pair of photons that have their polarizations entangled. Alice then operates on her photon, her part of the quantum state, to prepare one of four quantum states jointly held with Bob. When Bob receives Alice’s photon, he holds the complete state, he can determine which of the four states is present using a complete Bell state measurement. However, these “Bell-state measurements” are notoriously difficult to do. Usually Bob can at best only make out two of the four possible states that he is trying to distinguish. With the remaining two considered unidentifiable he effectively has three of the four possible values to play with. This means the channel has a maximum capacity of about 1.59 bits, rather than the two bits that are theoretically possible. One way to get around this is to use “hyperentanglement”, which involves entangling the particle pair together using two degrees of freedom, rather than just one. This allows Bob to differentiate between all four possible outputs. This was demonstrated in 2008 by researchers at the University of Illinois at Urbana-Champaign in the US, who used pairs of photons entangled simultaneously in spin and orbital angular momentum. They achieved what was then a record of 1.63 bits per channel. The Illinois team carried out its experiments by firing laser beams through free space. Pointing out that atmospheric turbulence quickly destroys photons’ orbital angular momentum states, they concluded that their set-up was probably only suited for data transmission between satellites. The latest work, in contrast, shows the potential of superdense coding for use across fibre-based communication networks. Travis Humble, Brian Williams and Ronald Sadlier of the Oak Ridge National Laboratory in Tennessee used a specially designed interferometer to entangle the arrival times, as well as the polarization, of pairs of photons. In this way they showed they could increase the channel capacity of a 2 m long piece of standard optical fibre cable, using standard photon detectors to carry out the measurements. 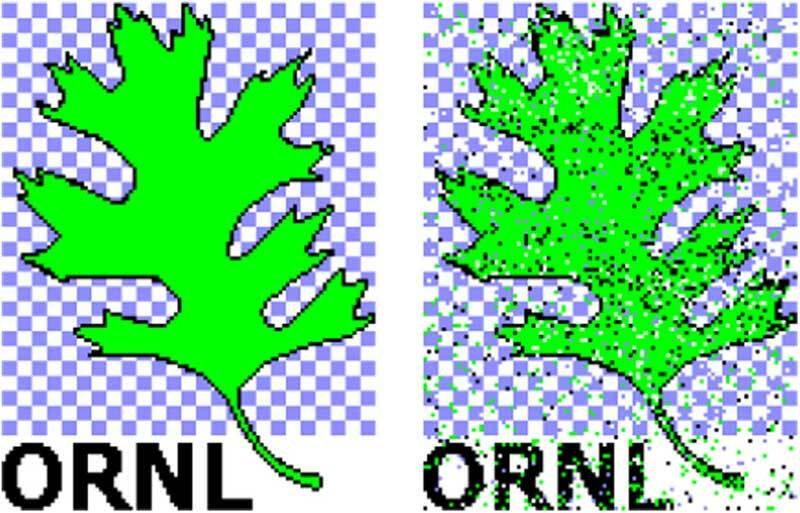 They report a new record of 1.67 bits per channel, demonstrating the feasibility of their approach by sending a 3.4 kilobyte image of an oak leaf – their lab’s logo – with a fidelity of 87% (see figure). “What is nice about our demonstration is that we were able to use off-the-shelf equipment,” says Williams. As to the relatively small gain over the previous record, he explains that the higher the capacity, the harder it becomes to improve that capacity. “People can run a four-minute mile but no-one will ever run a three-minute mile,” he says by analogy. A remarkable breakthrough for a useful realization of superdense coding over fibre. Julio Barreiro of the University of California, San Diego, who was part of the 2008 Illinois team, characterizes the earlier research as a “proof-of-principle demonstration”. In contrast, he says, the latest results constitute “a remarkable breakthrough for a useful realization of superdense coding over fibre”. Humble says that the research could in principle increase the bandwidth of large swathes of the internet. But he notes that there are significant technical challenges to overcome, including the fact that superdense coding requires much lower power levels than are used in today’s fibre networks in order to limit channel noise. Low power levels increase the cost of deployment significantly, making it unlikely that the quantum technique would be used for mainstream data transfer. Instead, Humble believes that standalone quantum networks could prove cost effective when it comes to specialist applications such as synchronizing atomic clocks around the world or setting up networks for high-performance computing. He adds that a partner organization of his group, the United States Army Research Laboratory, plans to build a standalone quantum network within the next three years.